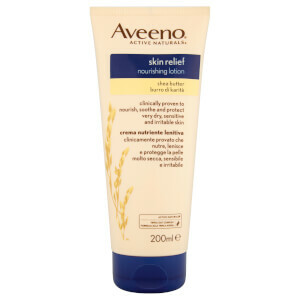 Catering specifically for dry skin, the Aveeno Skin Relief Body Lotion with Shea Butter instantly relieves itching and irritation for long-lasting comfort. 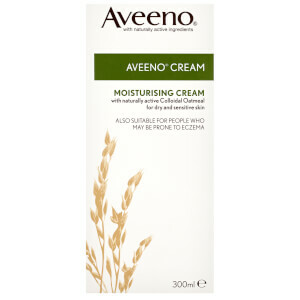 Fortified with moisturising Shea Butter and a naturally active Triple Oat Complex, the lightweight, quick-absorbing lotion delivers superior hydration, whilst helping to restore the skin's natural protective barrier. The body is soft, smooth and conditioned without greasy or sticky residue. [PR-001331] Aqua, Glycerin, Distearyldimonium Chloride, Petrolatum, Isopropyl Palmitate, Cetyl Alcohol, Dimethicone, Avena Sativa (Oat) Kernel Flour, Avena Sativa (Oat) Kernel Oil, Avena Sativa (Oat) Kernel Extract, Butyrospermum Parkii (Shea) Butter, Steareth-20, Isopropyl Alcohol, Sodium Chloride, BHT, Potassium Sorbate, Benzyl Alcohol. I never write reviews but I have tried every cream under the sun to keep my skin at bay. 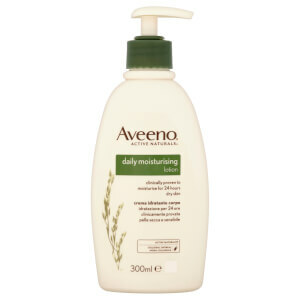 This is by far the best moisturizer I have found to keep my skin moisturized and prevent flare ups. I use it on my face as well. It isnt greasy and even stops me from feeling itchy which is a major point for me. 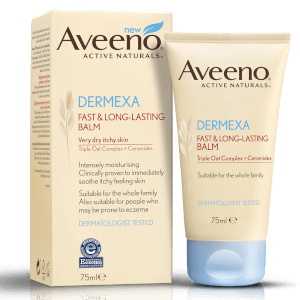 I have had eczema since I was a baby and nothing keeps my flare ups at bay like this cream.